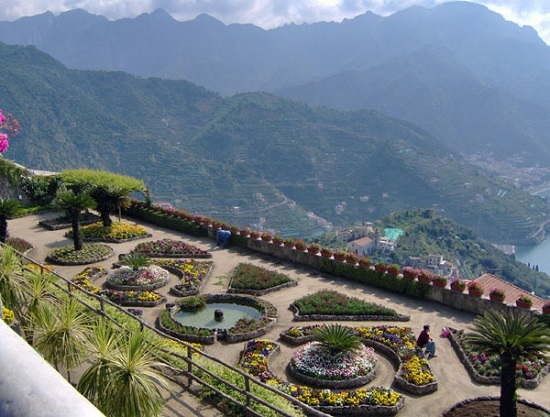 Due to its scenic wonders, the Town of Ravello is another of Campania's popular tourist destination. The panoramic road coming from Amalfi and Atrani climbs in hairpin bends up the narrow Dragon Valley (Valle del Dragone), planted with vines, fruit trees and olives. In 1996, the town was listed as a UNESCO World Heritage Site. Ravello was founded in the 5th century as a shelter place against the barbarian invasions which marked the end of the Western Roman Empire. In the 9th century Ravello was an important town of the maritime republic of Amalfi, a producer of wool from its surrounding country that was dyed in the town and an important trading power in the Mediterranean between 839 and around 1200. In 1086 it was made the seat of a bishopric by will of the Norman count Roger Borsa, as a counterweight to powerful Amalfi. In the 12th century it had some 25,000 inhabitants, and retains a disproportionate number of palazzi of the mercantile nobility, the Rufolo, d'Aflitto, Confalone and Della Marra. In 1137, after a first failed attack two years before, it was destroyed by the Republic of Pisa. After this event, it started a demographic and economical decline, and much of its population moved to Naples and its surroundings. The Duomo (Cathedral) of Ravello: the central nave contains the "Pulpit of the Gospels", on the right of the central nave, created in 1272 by Nicolò di Bartolomeo from Foggia. 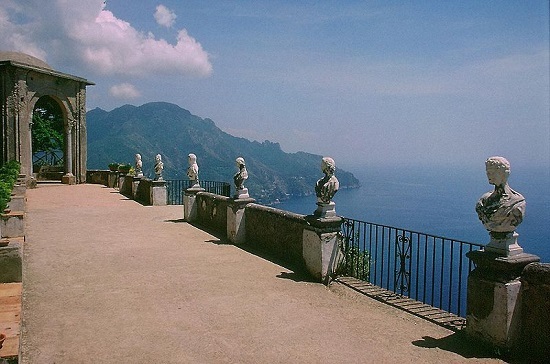 Villa Rufolo (1270), built by Nicola Rufolo, one of the richest Patricians of Ravello, on a ledge and it has become a famous attraction for thousands of visitors. The villa was mentioned by Giovanni Boccaccio in his Decameron and it is the place where Richard Wagner in 1880 was inspired for the stage design of his opera Parsifal. 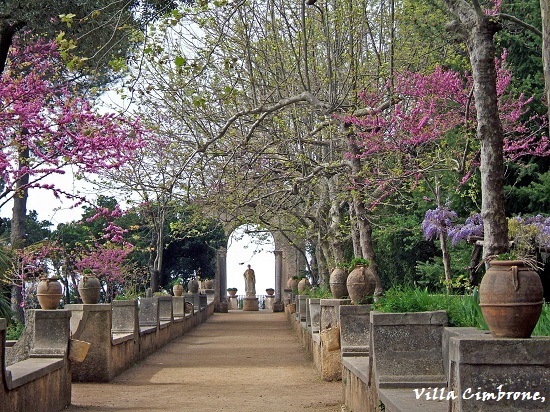 Villa Cimbrone, famous for its "Terrace of the Infinite" and gardens. The church of San Giovanni del Toro (Saint John of the Bull) dating to before the year 1000. The church contains the Bove pulpit, dateable to 1200–1230, incorporated as mosaic fragments Raqqa bacini. The small church of Santa Maria a Gradillo (11th century). It has a basilica plan, with three apses. 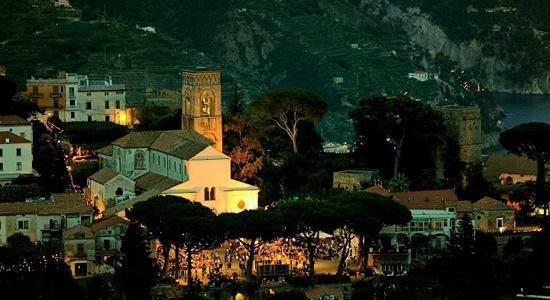 Events : Ravello Festival - From June to September .The annual summer Ravello Festival began as a salute to Wagner’s music, but now showcases a wide range of music and arts. It is one of the oldest and most renowned festivals in Italy. 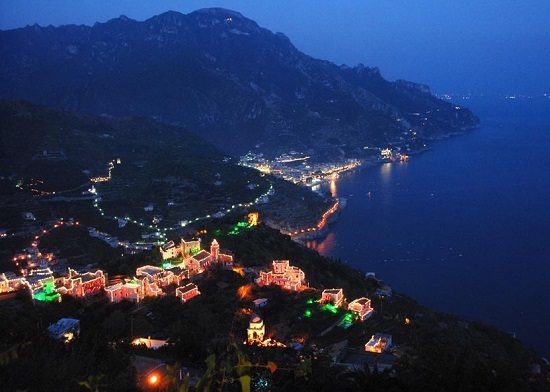 The Festival as we know it today is the outcome of a number of previous initiatives, and Girolamo Bottiglieri and Paolo Caruso were the chief architects of the annual event that led to Ravello becoming the “City of Music”.